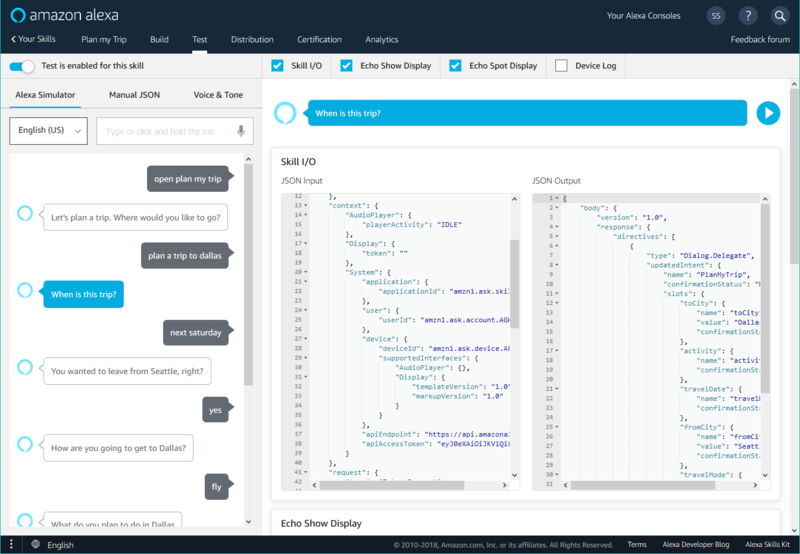 The developer console provides a streamlined experience to help you create, manage, and publish skills. 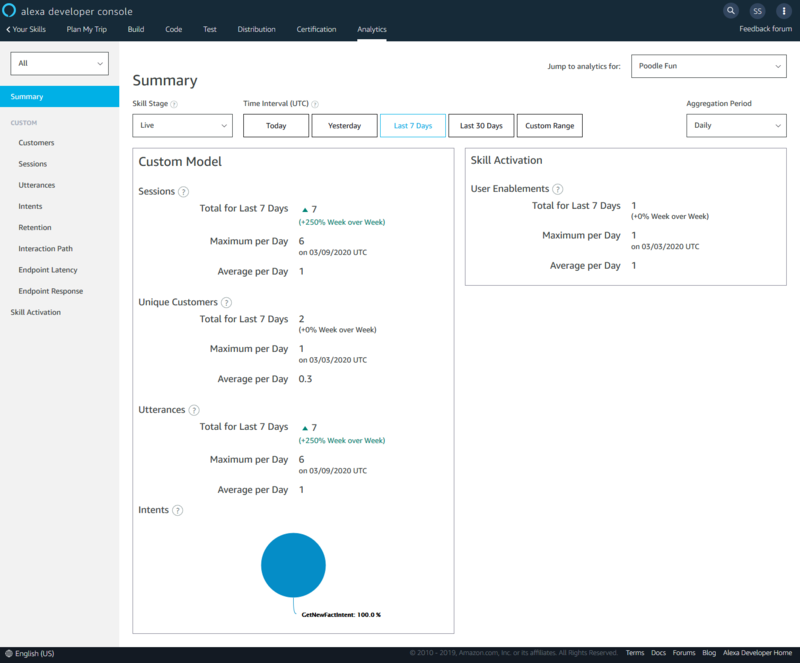 Use Build to set up your skill, configure the interaction model, and specify the endpoints for your service. The specific options you complete here depend on the model you add to the skill. For example, for a skill with a custom model, you create intents and sample utterances. For a skill with the pre-built smart home model, you provide the endpoint and account linking configuration. Use Test to test your skill with either text or voice. Use Distribution to preview how your skill will appear in the skill store. Use Certification to validate your skill, run pre-certification tests, and then submit the skill for certification. Use Analytics to review metrics for your skill such as number utterances, customers, and intents invoked. 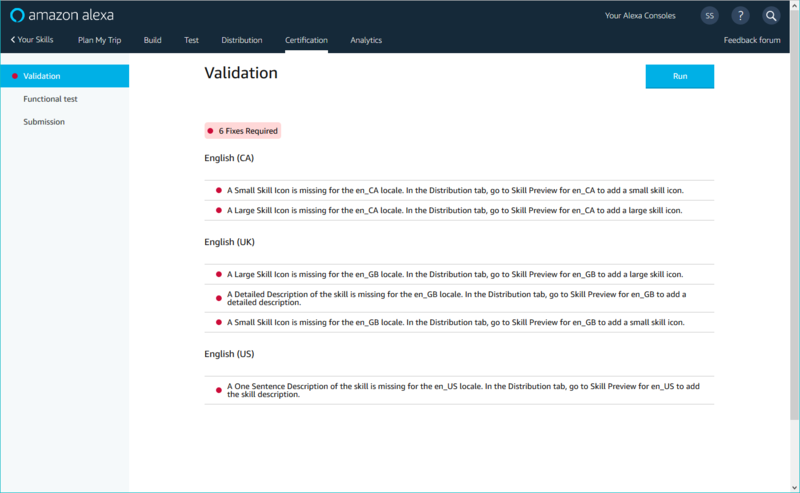 The first user associated with an Alexa developer account is considered the owner and will retain full rights to administer the developer account. Additional users can be invited to have access to the developer account. Invited users will have the rights associated with the role(s) assigned to the user. 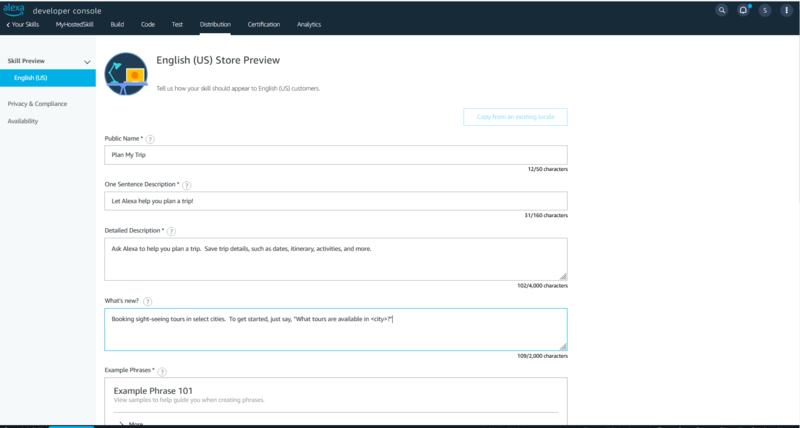 All roles will grant users the full access to create, modify and delete Alexa skills using the developer console. The Administrator and Analyst roles will also have access to the Earnings and Payments sections. The Administrator and Developer roles will have access to create, modify and delete Alexa skills using ASK CLI and SMAPI. Finally, users will also have rights to other parts of the developer console as described in the role descriptions. You can open the developer console, then create a new skill or edit an existing skill. The developer console displays a list of all your skills. You can edit any of these skills directly from this list. Route requests to the AWS Lambda function or web service that implements the skill. AWS Lambda is a service offering by Amazon Web Services. Display information about the skill in the Amazon Alexa App. The app shows all published skills, as well as all of your own skills currently under development. To create a new skill, open the console and click Create Skill. For more about how you create and configure a skill, see Create a Skill and Choose the Interaction Model. If you are familiar with the previous version of the developer console, see Where Can I Find… to see where you can configuration options in the developer console. Find the existing skill in the list and click Edit. Note: Once a skill is published to users, it is considered live. You cannot edit the configuration for a live skill. Instead, you can edit the development version. This version is displayed on the list of skills below the live version. See Revise and Update Your Skill after Publication. If you are familiar with the previous version of the console, use the following guide to find the same features in the developer console. Skill types are now called interaction models. You select the model when creating the skill. The sidebar displays a language drop-down list at the top. Select a language to switch to a different language. Select Language settings to configure additional languages. This is now the Public Name field on the Distribution page. Audio Player, Video App, and Render Template settings. Distribution > Availability. Expand the Beta Test section to see options for starting or managing a beta test. 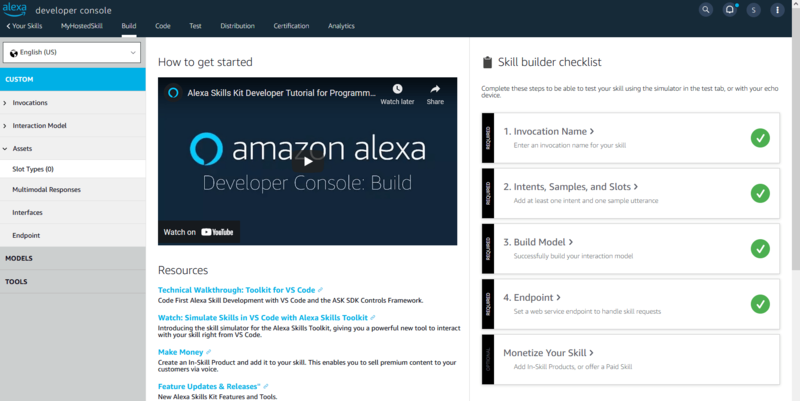 For more about beta testing, see Skills Beta Testing for Alexa Skills. See Create the Interaction Model for Your Skill. On the page for selecting the interaction model, click the View example utterances button for the model. This page applies to custom skills configured to use an HTTPS endpoint. These settings are now available on the Endpoint section of the Build page. Build > Custom > Endpoint. Under the text box for each region endpoint, select the SSL certificate type from the drop-down list. The self-signed certificate can be used only for testing. The new Test page replaces the previous Test Simulator. The new page has all the same functionality as the Test Simulator. Alexa Simulator replaces the Text tab. This now allows testing with either text or voice, and supports several features that were not available in the old service simulator. The Echo Show Display option replaces the Echo Show Render Response (beta). Echo Spot Display is added. The Skill Preview option on the Distribution page has a section for each language you have added to the skill. For example, the fields for the US English version are in Launch > Skill Preview > English (US). Distribution > Availability > Where would you like this skill to be available? Distribution > Privacy & Compliance > Does this skill allow users to make purchases or spend real money? Distribution > Privacy & Compliance > Does this Alexa skill collect users' personal information? Distribution > Privacy & Compliance > Is this skill directed to or does it target children under the age of 13? In the old console, you could access metrics for your skill with the Metrics link in the list of skills. In the developer console, metrics are available on the Analytics page. In the list of skills in the console, click the Analytics link in the row for the skill. When you open a skill to view or edit, click Analytics in the top navigation.